When I first proposed my Voynich/Optical theories years ago, one of the most common criticisms of it was that some of the microscope illustrations I used as comparisons were from dates later than the time of my theory. This is true, and I did acknowledge it. Of course I would, and can, still use them, as the descriptions of 1610/20 optical devices, and even earlier ones in some cases, do show that later 17th century optical instruments do have many of the features of the earlier, often lost and not illustrated, devices. Nonetheless, the problem did have an effect on the way I looked at this, but not necessarily the way the critics intended. They used this point to claim that the Voynich cylinders could not be microscopes, but at the same time, they were dismissing the fact that their observation also implies that if they were the microscopes they did agree they resembled, then the Voynich was newer than they, or even I, suggested. In effect they were ignoring an important implication, a possibility opened up by the very observation they were making. This is even more apparent when you consider that at least three of the newer microscope illustrations I was comparing to the Voynich cylinders were such a good match, that they could arguably be the actual source of the Voynich illustration. The two most notable are the “Green Microscope”, and of the ones in the Spanish engraving , both very similar to cylinders on the f101v pages. So if you take the critic’s point at face value, that the devices look “too new”, then one is open to any age for the Voynich between 1404 and 1912, when Wilfred said he found it. Considering these points, and when I began to seriously consider the Voynich Manuscript may be a 19th century fake, I of course revisited many of my old ideas in a new light. Here is the Green Microscope compared to an f101v cylinder. 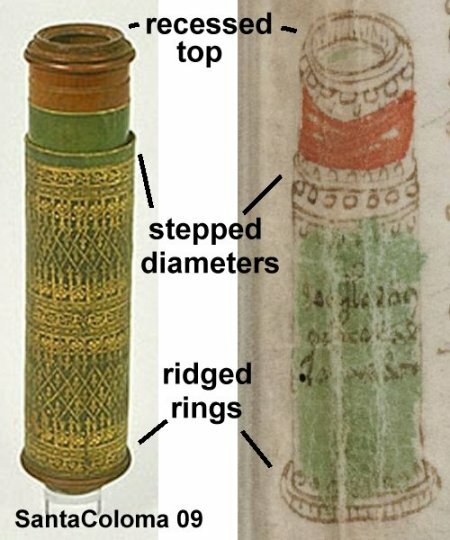 You can see that the coloration, proportion, the recessed top, the placement of the change in diameter, and the inclusion (if not the accurate representation) of decoration, show that the green microscope and this Voynich cylinder are strikingly similar. Even the green of the vellum covering, and the brown where the wooden portions of the microscope are bare, are seemingly represented. I think it can be said that if a person saw the actual microscope, and had the appropriate inks, pens and brushes, any resulting drawing would not be much different than the Voynich illustration. But in order for the Green Microscope to appear in an early 20th century forged manuscript, it would have to be reasonable to expect that the suspected forger would have seen it. And they probably would have had to have seen the actual device, and not a picture in a book, because color photographs in books were very uncommon before 1912. I have not seen this one, in any case, in all the microscope books I have found, either in black and white or color, photographed or illustrated. So for the real Green Microscope to be the model, it would have to be reasonable that Wilfred Voynich could have seen it. I went back to the website of the Museo Galileo, the museum which has the microscope, to see if this made sense. 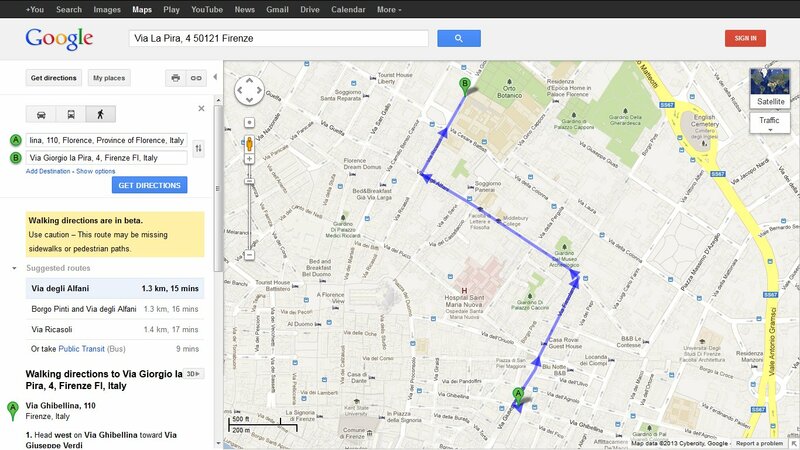 The Museo Galileo, it turns out, is in Florence, Italy. They have owned the Green Microscope since the early 18th century, as it is listed as a “Vincenzo Viviani” bequest. He died in 1703, so they have had it since about then. The museum does not apparently know the actual age or maker of this microscope… and it is listed as a “microscope part”, as they assume it is a “part of the body tube” of one… but they do speculate that it originates from the “late 17th century”. It was a practice at the time, on some microscopes, to have the central section of the device removable, in order to use it as a “field microscope”. Some were even made this way from the beginning, with no stand, to carry into the environment and study things in the field. The location of the museum in Florence was encouraging start, because in the early 20th century, Wilfred Voynich was also in Florence. He had purchased, in 1908, the great Libraria Franceschini, on 110 Via Ghibellina. And this vast book emporium, containing over half a million manuscripts, incunabula, pamphlets, maps, and who-knows-what, has often been suspected as a possible, real, source of the Voynich… even as the place Wilfred may have unearthed the little pile of unused ancient vellum he might have used to forge his famous cipher manuscript. Voynich, and the Green Microscope, and a vast archive of vellum were all in the same city, at the same time! So La Specola was the home of the green microscope during the time of Voynich’s presence in Florence. 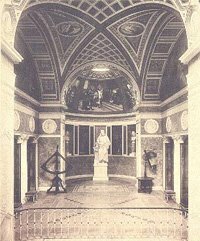 And it was, and is, the location of the Trubuna De Galileo, a magnificent alcove with a statue of Galileo, a series of friezes with important scenes from his life, and surrounded by rooms which contained the collections of antique scientific instruments of the Viviani collection, and others. And it turned out that that collection was at 4 Via Georgio La Pira, a mere 1.3 kilometer, 15 minute walk from the doors of Voynich’s Libraria. The Green Microscope was 15 minutes from the man who “found” the Voynich Manuscript, which contains an image which virtually reflects the very same device. … so then why did Voynich not see, and note, the similarity between one of the drawings, and the Green Microscope, himself? Because he could not point to it, any more that he could point directly to the Baresch letter, or any other possible sources for a fake… if he forged the Voynich Manuscript. Well, unless you want to theorize that he the man had very poor observational skills, or worse, that he was never tempted, at least once in 5 years, to take what must be a fantastic stroll through the streets of one of the world’s most beautiful cities, to the greatest collection of rare and important scientific instruments in the world.